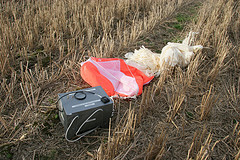 High Altitude Ballooning isn't an easy hobby! It requires quite a bit of planning and work but we think its worth it. Feel free to ask questions, if people don't know they'll know where to find the answer. Come along to a launch - best ask first if you can come, nearly always the answer will be yes, be prepared to be roped in - need all the help we can get! Do some data processing, mosaic some images, help with the flight prediction, write some software to help with the flight. Work on the wiki, write a new articles, update existing pages and correct spelilng msitakes. 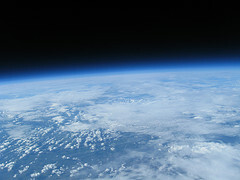 a payload (an insulated box containing some electronics such as a GPS and a radio to allow you to follow progress) is attached to a balloon which is filled with helium (He). 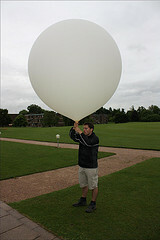 The balloon is released and, as He is lighter than air, the balloon rises and pulls the payload with it. As the balloon rises the outside pressure decreases which leads to the helium inside the balloon expanding (imagine like its expanding to fill the gap as the outside pressure decreases), this causes the balloon to stretch. The balloon is made of a form of latex and is incredibly stretchy however it gets to a point where it can't stretch any more and bursts. Now that there isn't any upward pull from the balloon the payload begins to fall to earth pulled by gravity, as it falls the parachute opens up slowing its descent and it gently glides down to earth. Throughout the flight the GPS module in the payload box is providing information on its position, this information is passed through a microcontroller which reads the info and converts it into another protocol and in most payloads transmits the data over a radio link to the ground station. As a backup sometimes there is also a mobile phone which sends the data as a SMS as well (however this will only work near to the ground as mobile phones don't get signal at high altitudes). 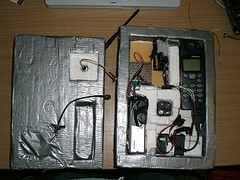 Therefore if you want to fly a HAB mission you need to construct a payload box with a tracking device (e.g. GPS module, microcontoller and then a radio/mobile phone). Additional components include for example cameras and temperature sensor. You also will need a parachute, a balloon and some helium and permission to launch. Permission in the UK comes from the CAA (Civil Aviation Authority), For more details see restrictions_legality. Getting a system that works is harder then it sounds, HAB payloads are difficult to test in advance so there is a failure rate that unfortunately affects us all. The better planned a payload/flight the less chance of something going wrong. If something doesn't go to plan you just need to learn from the problem, fix it and try again - its happen to us all! The key to High Altitude Ballooning is to try to be as safe as possible at all times. Like all things there are a number of situations that could cause harm or damage to either you or other people - it is very important to bear this in mind when you are planning, construction and flying High Altitude Balloon missions. Secondly you need to remember that HAB flights cross a number of 'fields' e.g transmitting in radio bands and travelling through airspace. There are other users of these 'fields' both professional and amateur - it is important to recognise that they have as much right and often even more right to do what they do - try to avoid interfering. We strive to construct as light a payload as possible - this both makes it safer in flight and on landing but also allows us to optimise our flights as we require less helium and can achieve even higher altitudes. Payloads are also insulated with polystyrene and this helps to soften the landing. 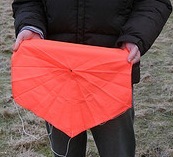 All payloads fly with a parachute attached, these are usually pre-deployed to reduce the risk of something going wrong and will slow the payloads descent after the balloon has burst. Careful planning goes into a balloon launch and we have increasingly sophisticated prediction software (check out CUSF's landing predictor). We only launch when we know its safe, we avoid flight profiles that could land in towns and cities and also the sea - it helps to be able to get the payload back! Please be careful with electronics e.g. camera capacitors can give you quite a nasty shock! Soldering irons get hot! The solder also gives off fumes so its important that your are is well ventilated. Polystyrene is quite hard to cut so often is cut/melted with a hot wire cutter - again this can give off fumes so ventilate well. High powered radios (something not often used in HAB) when transmitting can give very nasty RF burns - don't hold on to the antenna when transmitting. High Altitude Ballooning is a multi-skilled hobby in which you get to explore a region of the earth “Near Space” without the need for enormous budgets and national departments or agencies. It tests your abilities to plan, design and construct electronics, teaches you about radio theory and gps modules and then allows you to put all this to the test at an altitude of 30km, -50 deg C and less then 1% atmospheres. Oh and its a lot of fun. It doesn't have to be, depending on the components payloads can be constructed for less the £50 including a gps and radio module. Flying the mission itself can add to the cost, balloons vary in cost from £25 to £100 and helium also costs money - usually around £80. Why don't you use Hydrogen rather then Helium? Hydrogen in some senses is better then Helium; it has more lift, doesn't diffuse out of the balloon as fast as helium and also is cheaper. However as is popularly known if mixed with the right quantities of air (surprisingly difficult to do) it can be incredibly explosive - we feel best to stick with the inert slightly more expensive helium and not run the risk and therefore not need the additional safety precautions that would be required. That said using compressed helium still has its risks and requires sensible operation. Can any batteries be used? The voltage supplied by batteries is temperature dependent and for most batteries when the temperature drops below 0 deg C they struggle to supply the necessary voltage. Lithium batteries however are far more resilient and nearly all flights use the unrechargeable Lithium Energizers which are easy to get hold of. Another possibility are Lithium Polymer cells, these are rechargeable and can supply a large current however they haven't been rigorously flight tested and there are concerns about maintenance of their structural integrity - unfortunately Lithium cells when damaged can become unstable and explode! See the power supply page for more information. What is a microprocessor? Where should I start? Microprocessors can be regarded as programmable chips that can act like simple computers. They vary in complexity, ease of use and cost. The most basic use in a payload is to read the data coming from the GPS module about its location and convert this into a protocol that can be transmitted down the radio to the ground station. However most flight computers have additional functions such as reading sensors, saving the data to some form of storage and triggering cameras. There are a wide range of microprocessors with different strengths and weaknesses and nearly everyone prefers a different one. More information can be found on the flight computer page. The best approach to starting with a microprocessor is to get some form of development board such as an Arduino, AVR dev board from olimex. As these chips can be purchased individually you can also make your own development board - there are many designs floating around the web. What radios do you use? In the air the main workhorse on the payloads are Radiometrix NTX2 434.075Mhz 10mW modules. These modules are licence exempt and so can be used by anyone and have been allowed by Ofcom to be used in the air as well as on land. To listen to the payloads transmissions the receiving radio need to be able to listen to 70cm band (430-440Mhz) and be able to receive SSB. There are many radios available - Amateur radios are often more sensitive then scanners and so are preferable. For many years the Yaesu FT-790r radio was the key receiver however these days more advanced radios are used including the Yaesu FT-817 and the Icom IC-7000. Antenna wise when near to the balloon a whip will suffice however as the balloon drifts away it might be necessary to use a Yagi as this antenna is more directional. An excellent guide to understanding direction antennas can be found on this youtube video by Diana Eng of Make Magazine - while its for transmitting its the same concept for receiving! 10mW of power from a radio is rubbish - the datasheet quote a couple of hundred metres range! Explain? The datasheet of these radio modules quote the range of the modules when using them on the ground where there is a poor line of sight (LOS) and using the matching receiver. When we fly these modules on our payloads we get excellent uninterrupted LOS and we use far more sensitive radios to listen in coupled with good antennas. This increases the range massively - enough to get a couple of hundred miles range! While this is all good when the payload is in the air when it nears the ground the range reduces as we lose LOS and the range is similar to what is quoted. It is therefore important to either have a GSM communication system that sends you a SMS with the final location or chase the payload so that you are close by when it lands. Can I use amateur radio on my payloads? If you're in the UK unfortunately not, the amateur radio licence doesn't extend to use of radios in the air, just on the ground. However do not panic - using the Radiometrix NTX2 will give you a range of a couple of hundred miles even on 10mW - remember you have an incredible line of sight! With this module and a microprocessor we have been able to use a number of data protocols including CW (Morse), RTTY, DominoEX and send images using SSTV! Legislation in other countries varies. Here you can see which parts are all required for launching a balloon.